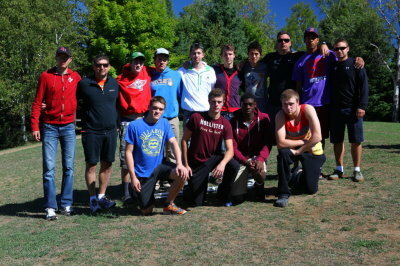 The 18U Black travelled to Welland this past weekend for the McGregor Cup, Premier Division. Seeded number one after winning gold medals in both of the first two OVA tournaments, every other team wanted to play their best against our boys. First up was a hard-hitting Onyx team. Despite some trading of points, Attack took this one 25-22, and 25-15. Next in pool play was the new London Fire volleyball team. This team is a big team with some serious talent. Once again there was some trading of points and a few runs, but the Attack prevailed in two very close sets, 25-23 and 26-24. The quarter-final saw Attack Black take on Attack Red……the inter-club matches are always challenging and the Red team definitely played with purpose and drive. Despite Red dropping the first set 15-25, they came back and won the second set and definitely got Black’s attention. Attack Black took the third set and it was on to the semi-finals. In the semi Kitchener Predators were the opposition. This match saw Attack play its best volleyball of the day. The boys played with confidence and focus, and all aspects of their game were on. As a result this one ended in straight sets. Pakmen were once again the opponent in the Gold final. Pakmen were definitely loose and playing their best volleyball. They are a very good team, with solid defence as well as heavy hitting offence. The Attack team was a bit sluggish and not at its best….dropping the first set 20-25. In the second set Pakmen had confidence and once again Attack was not totally into the match…….with the result that they saw themselves down 10-19 and therefore facing a drubbing. Some serious pride kicked in at that point, and the team ran off nine straight points to tie the set at 19 – 19. They then traded points and it was 23-23, but an unforced error and a bit of bad luck resulted in a loss, 23-25. With the silver the boys will be reflecting on what needs to happen between now and the next tournament in order to take their third gold medal of the OVA season. The 18U Black travelled to Daytona for the annual Florida Fest on Feb.2-3. This USA Bid tourney attracts teams from all over Florida as well as the southern USA, and even a team from Calgary. Attack opened against Orlando Gold (white team), winning 25-13, 25-12. Next up was STORM-2 from Georgia, with Attack handling them easily 25-8, 25-8. The last match of pool play was closer, Attack winning 25-18, 25-20 against Ocean Bay Quik out of Ft. Lauderdale. Attack was attracting some serious attention, with crowds steadily increasing over the course of the day, and lots of interest from coaches all over. After finishing first in the pool, the crossover game saw us facing Orlando Gold. This was a good match and saw the team playing very well, winning 25-20, 25-21. Following that match it was off to a seafood team dinner and a chance to get some sleep, with the Gold bracket semi-final taking place on Sunday morning at 11 a.m. The semi-final game against Tampa Bay Invaders was the absolute best match of the tournament, with the two strongest teams going at it, working incredibly hard for every point! The Invaders are a nationally ranked team with some USA National High Performance players. Our boys had to bring their game…..and they did! The first set was very close, with Tampa taking it 23-25. Attack stormed back to win the next one 25-18. This set things up for an incredibly exciting third set. This one was amazing, with Attack first to 12…..but eventually falling 16-18, to the Tampa Bay Invaders who went on to win the gold in straight sets. In the Bronze it was no contest with Attack defeating Georgia Storm’s first team by scores of 25-12 and 25-12. Final tournament rankings put Durham Attack in second spot….just one swing away from being champions. This was a great experience for the team, and our boys and coaches did their club, the OVA, and Canada proud! Boys’ 18U Black Begins OVA Season with the colour Gold! In Cambridge for the Premier Division of the opening tournament of the OVA season, the 18U Black Attack started things off on the right track. The boys played well in pool play against X-Men and a strong and tenacious Breakers team. The Breakers managed to take the second set, but the Attack stormed back in the third, winning it solidly. Placing first in their pool, Attack faced the 17U Pakmen in the quarters. This one wasn’t close with Attack dominating on offence and defence. There were some serious highlights for the fans with great hitting and blocking! In the semi-final the opposition was MAC, which had surprised some observers with very strong play. This was a very well-played match with a high degree of skill demonstrated by both teams. However, Attack Black took charge mid-way through and won it in straight sets. Among the highlights was the Attack blocking ……. The fans were very impressed. Pakmen 18U were the opposition in the gold medal final. They are a very big, talented, and experienced team and they were ready for the Attack. Our young men rose to the challenge and came out strong early in the match, going up by six points in the first set. Pakmen however pushed back and took the lead 21-19. Despite being down, and under lots of pressure, our boys had tremendous passing and did not make mistakes down the stretch, taking this first set 25-23. The second set of this match saw the boys play their best volleyball to date……passing, setting, hitting, blocking, serving…it was all there, and it was all impressive! Attack dominated this set, taking it 25-12……and bringing home the gold. This was truly a team effort! We look forward to more exciting volleyball in the new year! 18U Boys Attack Black Make a Statement in Chicago! This past weekend the 18U boys’ Black travelled to the Great Lakes Volleyball Academy outside of Chicago, home of the Sports Performance Volleyball Club, to take part in a tournament. Perhaps a little groggy from the travel, Attack started the pool play slowly, but won its opening match 25-17, 25-27, 24-22. Lucas, Jeff, and Cole P established a strong hitting game very early in that one. The second match things started flowing with Attack overwhelming their opponent 25-15, 25-7. Nate had numerous kills, with Cole having excellent serves. Next up was the SPVC 18 team two, which gave Attack a good match, but we prevailed 25-23, 25-20. Mac had outstanding blocking going, Lucas was very strong all around, and Connor had amazing digs. Day two opened with quarter-final matches and the boys picked up where they left off, opening the match 25-15. In the second set things were closer, 25-23. Jeremy showed his strength in this one, with Francois passing very well. In the semis we were up against the ‘Mizuno’ 17 -1 team, or the top 17 team. This team was ranked very high in the USA when they were 16 year-olds, and they played very well against the Attack, but once again, Attack showed great defence with Bailey passing solidly, as well as offence with Wells setting the table, and won 25-18, 25-21. So, now it was on to the Gold Medal match against the SPVC Mizuno 18-1 team, a top-ten in the USA ranked team. Mizuno was playing at home in its fifth age-group (slightly older than Canadian rules) tournament of the season; Attack was playing in its first, on the road, using the American ball. However the boys weren’t looking for excuses, they came to play! And play they did! This one was very exciting, back and forth, lots of powerful hitting by both sides. Mizuno took the first set 25-27, but Attack came back and won the next one 25-21. In the third set despite taking an early lead, the home side won 11-15. This was national caliber volleyball and Attack Black was right there! Special thanks to Coach Eibbitt, Coach Graham, and a special thank you to Coach Grossinger for making the trip despite Cole G’s injury which kept him at home. Get well soon Cole!